"The non-existent has no existence; the existent does not not-exist. (Thus) the seers who have seen the essence of That reached the conclusion about the two." - The Bhagavadgita 2:16. "It is neither born nor dies. At no time it did not non-exist in the past; will not non-exist in future; or will not become existence again. Unborn, eternal, permanent, and the most ancient, this is not killed when the body is killed." - The Bhagavadgita 2:20. Whatever thoughts and opinions we entertain in our minds, there is always another opinion and another thought, or there are multiple opinions and multiple thoughts, which may either contradict it or compliment it. On a single subject, a thousand people may come out with a thousand opinions. If you have any doubts, look at the message boards, newspapers, books, articles, religious scriptures, discourses by various masters and gurus, and the numerous conflicts that happen, for one reason or the other, between people, groups, organizations and nations in various parts of the world. Even in matters of religion, we have no unanimity. The scriptures may agree on certain points, but in many fundamental aspects, they are as divergent as human nature itself. It is difficult to ascertain physically what the scriptures say about the metaphysical truths. Yet millions of people everyday hold on to their beliefs and opinions tenaciously, refusing to step outside of their habitual thought patterns and constricted opinions and give themselves a chance to see the reality around them differently from different perspectives. This happens because the human mind likes to follow the path of least resistance and spend as little time as possible on analysis and assimilation so that it can focus more on essential things and maximize the chances of our survival, adaptability and continuity. Therefore, it resorts to shortcuts and mental heuristics such as generalizations and stereotyping to make sense of the world and respond quickly to the challenges we face every day. According to science, truth is what is provable either with logic or with facts or both. If you say something happened and if you witnessed it, you must be in a position to prove it even to those who did not see it. Even though it seems straightforward, in many cases it is not. Hence, not all the courts and laws in the world guarantee justice all the time. You are lucky if you are able to prove your point of view. You are also lucky if you are able to prove your scientific truths, because there are many truths that cannot be proved scientifically not because they are not true but because we do not have the wherewithal to prove them. In our world, there are many aspects to truth. We consider truth either relative that is true in relation to something else or absolute that is true under all circumstances, independent of other things. There are eternal truths and temporary truths. Some truths are eternal. For example, from the scientific perspective, the space (as we know it) will exist eternally, even if the material world that exists in it is destroyed. May be, in reality, space is not what we consider it to be. It may be a type of element (tattva) or even matter (matra), which comes into existence at the time of the formation of the universe. If it is so, then space may not qualify as eternal. In Hinduism, space is considered an element (akasa), just like water, earth, fire and air. Therefore, although space connects one world or planet with another and the earthly beings with the rest of the universe and although it facilitates the movement of prayers and sacred sounds as their medium, at some point of time in creation, it may end like everything else1. Relative truths are conditional, contextual, provable, temporary and relational. Because they depend upon certain conditions and factors, they may be inconsistent and unreliable. We can mitigate this problem to some extent by examining a truth from several perspectives. Jainism advocates such an approach through its theory of standpoints (syadavada), according to which truth may be valid only from particular standpoints and it may appear differently from different standpoints. The only way to ascertain its veracity, though may not always completely, is by considering it from different standpoints. The standpoints are like different perspectives or different angles or sides to examine a truth. From our experience, we know that we gain insight into things only when we dwell into them deeply and examine them thoroughly from various aspects. So practically speaking, the theory of standpoints makes sense. If you want to know more about syadavada, please check the articles on Jainism available at Hinduwebsite.com. While relative truths may be actually half-truths or untruths masquerading as truths, absolute truths are different. They are impervious to the fallacies and limitations of the human mind and intellect. Absolute truths are transcendental truths, in knowing which the mind and the senses play no role at all. They are independent of the mind, independent of intelligence, independent of logic, independent of perspective, independent of the senses, independent of the objects, independent of the subject, independent of proof, independent of conditions, and independent of memory. An absolute truth is indestructible, indefinable, indescribable, eternal, immutable, self-existent and permanent. If we go by this definition of truth, the whole world and all the knowledge that we hold in our minds do not qualify as truth. Nothing that falls within the domain of the mind and its faculties also qualify as absolute truth. The world exists in our minds as a concept and concepts are what they are, mere concepts. A hundred people may live in the same space and time and yet experience the world differently. Hindu scriptures therefore consider the phenomenal world as illusory and false, and hold only God and the Self as true. Satyam is that which contains Sat or Truth. Sat is that which is true, constant, real, actual, not in a limited way, but wholly and eternally. According to the Upanishads, God or Brahman and the individual Self alone qualify to be That, which is everlasting and absolutely true. Ancient Indians established some standards (pramana) to ascertain truths of our existence. The most prominent among them are, direct knowledge (pratyaksha), testimony (shabda) and inference (anumana). Of them, we may consider the first one reliable by itself, the second useful for corroboration or confirmation and the third no so reliable, but helpful on certain occasions. Pratyaksha is what we may perceive or experience directly and personally. It is therefore somewhat reliable, although we cannot take our experiences for granted fully. We may consider our direct experiences valid in case of general and ordinary truths. However, we should also be aware of defective perceptions and perceptual biases to which our minds and senses are susceptible. We know that our senses and our minds are not perfect instruments of knowledge. What we see may not be true and what we do not see may not be false. It is as if we live in a world of fog and mist, which is our own ignorance. We may see what we want to see or see it differently from what it actually is, or see it incorrectly, or not see it at all. We may mistake one for another. We may also see or experience something but not recognize it at all because we have never experienced it before or know nothing about it. Therefore, while direct experience is helpful, we have to be careful about what conclusions and observations we may draw from it. This is where the testimony of the scriptures and the accounts of experts prove helpful. If our direct experience is validated by the testimony of scriptures or expert knowledge, we can accept them as more reliable and accurate, although there may still be issues that need to be resolved and gaps in our understanding and awareness that need to be filled. However, by far, within the limitations to which we are subject, direct experience is the best way to arrive at truth. Inference is also useful; but we can never be sure. Sometime we may combine inference with testimony to arrive at truth. However, it is less reliable than the truths that we ascertain with direct knowledge supported by testimony. Various schools of Hindu philosophy identify other ways of knowing truth. However, they are not as reliable as the three we have discussed. 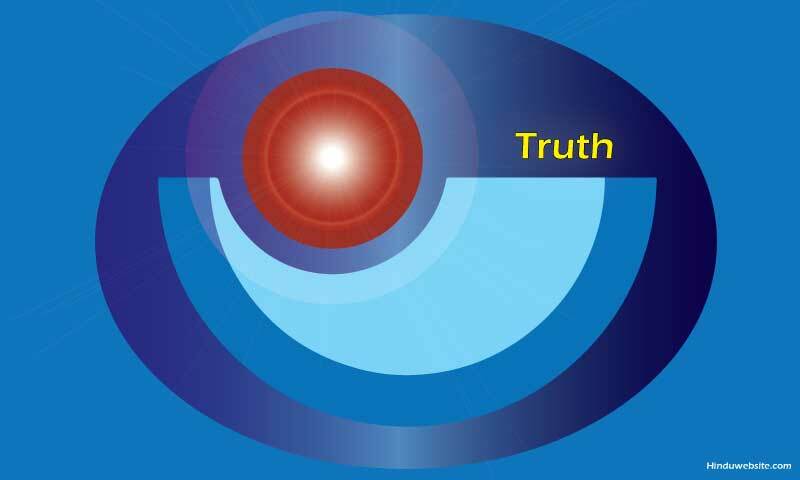 From a philosophical perspective, in Hinduism truth must have some characteristics in order to be accepted as truth. Here are some important ones. 1. Truth must be universal. That is, it must be the same everywhere. For example, we may say only the present moment is truth; but the present moment exists only in the context of the present. What happens in my mind may be true, but only within my mind. What happens in your life may be true; but it will be difficult for you to corroborate your experiences or even prove them to others that they ever happened. Time, space and memory obliterate many empirical truths of our lives and fill our minds with dejection, frustration and nostalgia. From this perspective, none of the things that we possess or experience qualifies as truth. Hence, Hinduism regards the objective world as untrue or an illusion. 2. Truth must be indestructible or incorruptible. Truth must remain impervious to falsehood. If one can falsify truth or destroy it, it does not qualify as truth because that which falsifies, corrupts or destroys truth becomes superior to it, where as truth has to be invincible, eternal, universal and supreme to be qualified as truth. 3. Truth must be constant. Truth cannot change. If something keeps changing, it is difficult to prove its existence. For example, we cannot prove the existence of earth five billion years ago. We will not be able to prove its existence after another five billion years later. Whatever that happened in our lives exists in our consciousness as memory. It might have happened or might not have happened exactly as we think or remember, because our thoughts and memories might have been corrupted by our own illusions, falsification and superimposition of other related memories. Billions of people lived and died upon earth in the past. The earth itself underwent great transformation over these millenniums. Our civilization passed through numerous phases of transformation and advancement. The world that existed a few thousand years ago was incredibly different from the world in which we live today. It may sound strange, but we do not live in the same world always and we do not relate with it only physically. Different worlds exist in the same space at different points of time and we live in different worlds in different planes and at different points of times, although outwardly we may believe that we live in the same world. It is same with our bodies. Our bodies grow, age and decay. They exist only in the context of time and space and certain conditions and circumstances. It is true with almost everything we experience in our lives. People are not the same. Your friends and relations are not the same. You do not know which one of them, or which aspect of them, is true. Truth is different. It is constant all the time. You do not have to worry that It will change or treat you differently. It does not love you or detest you because it is not subject to fluctuating moods, desires, self-interest or states of love and hatred. 4. Truth must be independent. Truth has to be self-existent and independent to qualify as truth. If it depends upon another entity for its existence, it loses its autonomy, continuity, purity, invincibility and universality. If it is supported by others, you can destroy it, falsify it, or corrupt it easily by taking away its support or modifying it. Truth should therefore exist by itself, without the support of proof or validation, without the process of knowing or without the help of the the knower and the known. In this context, time is not truth, because it depends upon many factors for its continuity. Our knowledge is not truth because it depends upon duality and several other things for its validation and knowing. The world is not truth, because it depends upon the earth. The earth is not truth because it depends upon other planets and the Sun. The solar system is not truth because it depends upon the universe. The material universe is not truth, because it depends upon time and space continuum to exist. The heaven is not truth because it depends upon another for support. What we experience in our lives is not truth because it depends upon the mind and the senses, which are in turn dependent upon other things that are in themselves dependent and bound to others. 5. Truth must be the cause or the source, but not the effect. The effect depends upon the cause for its survival, composition and existence. Each effect has a beginning and an end, where as Truth is eternal. If you take away the cause, the effect will disappear. The cause itself must be original and independent. It must neither depend upon other causes nor arise from them consequently. It must remain pure and constant, while producing or creating the effect and should not depend upon external conditions to create it. In this context, the entire material universe, the heaven and other worlds do not qualify as truth because they are products of creation and their source is elsewhere. As you can see from the above, our world, our lives and our very existence do not qualify as truth. There is nothing here or on other planets or the entire universe, which fits perfectly in the concept of truth as envisaged in Hindu scriptures. No religion that exists in the world or that ever existed in the past represents truth adequately and satisfactorily2. Our definitions of God do not qualify as truth because they are rooted in our divisive and relative mentality and they arise from our notions of right and wrong, name and form and time and space. Our minds cannot grasp absolute truths because they are not conditioned or created to grasp them. We may have a millions opinions and a million standpoints; but they do not take us anywhere near the Truth that exists universally, absolutely, independently, indestructibly and eternally. To understand truth, we have to overcome our own senses and minds. We have to transcend our limited awareness and remove all the obstructions, obstacles and blockages that stand between us and the truth. We have to transcend duality, the pairs of opposites, our attachments and our very intellect that revolves around our notions, opinions, concepts and rigid beliefs. Only a few people therefore will come anywhere near the infinite Truth and even they do not know. The Upanishads understand this predicament and admit the difficulty in expressing the truths about the Truth. The Kena Upanishad sums up the paradox of knowing the eternal Truth, which it equates with Brahman, in the following (2.1-3) instruction from an enlightened teacher (guru) who was trying to explain to his students what they needed to know Brahman, referred here in neutral terms as "It". This brings us to the final question or doubt. Whatever that I have presented here about Truth, is it true? Have I understood the Truth and explained it well? Perhaps I have; or maybe not. The only reason it stands the test of truth is that it is based on and supported by the testimony of scriptures, which are considered revelations of Truth itself. It is important to know that what is presented here is about the absolute truth, the real Truth, not the relative and temporary truths about which we quarrel and argue so frequently. 1. Modern science does speculate upon the possibility of folding the space or manipulating it, wherein also is hidden the key to time travel and future space travel. 2. Which is why Hinduism is very tolerant of all paths that attempt to reach the Absolute Truth in their own effective ways.